Experts in the development of state-of-the-art commercial and industrial laundry facilities since 1974. The filmmaker, Jeffrey Orgill, and his wife, Sarah, have flourishing careers. Sarah is a popular AP English teacher at a local high school and Jeffrey is a film producer and screenwriter/editor for a well-known cable TV channel. Though they love their ‘day jobs’, both confess to having an entrepreneurial spirit which is a major reason they ended up in the coin laundry business. After considering an array of ventures, they decided that the retail laundry business was a solid investment they could reasonably operate while still doing their day jobs. They spent more than a year intensively researching the industry. Their research led them to some industry experts who helped them understand that, in addition to location, one of the most important features of a successful laundromat is modern, efficient commercial washers and dryers that are built to last. The brand the experts recommended more often than not was Dexter Laundry. Armed with that knowledge, the Orgills made contact with Michael Ambrose, the local sales rep with California Dexter Laundry distributor, Western State Design. They spent a lot of time working with Ambrose, who helped them evaluate a number of different laundromats for sale throughout L.A. Not only is Ambrose very enthusiastic and knowledgeable about the industry, he has a lot of experience under his belt which makes him able to readily identify promising properties. 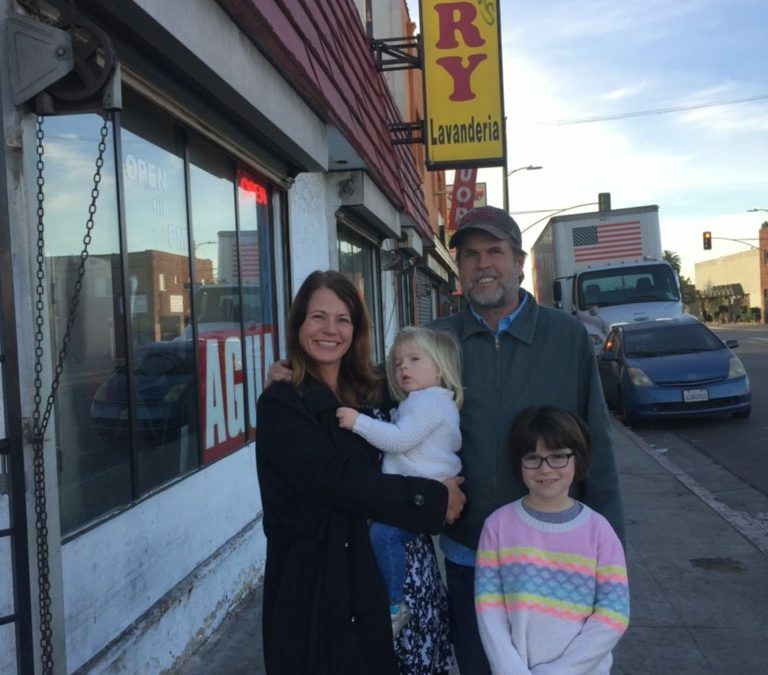 As luck would have it, In the midst of this process, a store came on the market in a great location only five minutes from their home in south Los Angeles. But before making an offer, Jeffrey continued his due diligence by spending as much time as he could in the 29-year-old laundromat, observing how things worked under the former management. He noticed that the store experienced many problems related to its dysfunctional commercial laundry equipment. These problems necessitated constant attention from the attendant as well as from a technician who was always being called in to fix the machines. In the course of his visits, Jeffrey struck up a conversation with this technician who also happened to recommend Dexter Laundry equipment. He explained that he would expect well-maintained, similarly-aged (10-12 years old) Dexter washers and dryers to be functioning close to the way they are when they’re brand new, unlike the brand he had been brought in to service. The Orgills bit the bullet and bought the store in late 2017. They initially brought in a consultant to help them get started, but they didn’t agree with their recommendations. Instead, they continued to follow Ambrose’s advice, which made more sense to them. Ambrose focused on the stores “first impression” and equipment mix designed to maximize Orgill’s revenue per square foot. In addition, Dexter Laundry’s customer service department was really helpful, as was the Western State Design Dexter Service School Jeffrey attended. 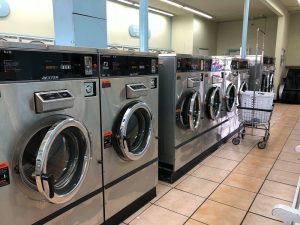 With the exception of the T-1200 washing machines, they chose Dexter Express laundry machines because of their efficiency: they not only enable customers to get in and out of the laundromat quickly, they save water, which is a big deal in southern California. And, indeed, after reopening, they saw an immediate 20-30% savings in their water bill (Ambrose had predicted a 22% savings). The Orgills are really happy with their new laundromat, especially the gleaming, new Dexter machines, as are the customers. The technician they work with regularly tells them how wonderful the Dexter equipment is. He says they’re easy to maintain, and the parts are readily available since they’re manufactured in the U.S and Western State Design has a large local inventory. Getting the revamped coin laundry business up and running was not without its challenges, some of which have eaten into the profit margin, but things are looking up now that they’ve been open for the better part of a year. 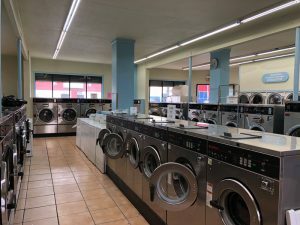 The laundromat is in an up-and-coming area of Los Angeles which boasts a number of new attractions including the new Coliseum, soccer stadium and the much-heralded George Lucas Museum of Narrative Art. And, we repeat, it’s only five minutes from the Orgill’s home—another big deal in L.A.! Looking ahead, the Orgills see the coin laundry as a vehicle toward independence, allowing them to spend more time with their two children. They also look forward to being able to spend more time engaged in their favorite family pastime: sailing! After all, having a good quality of life is what it’s all about. For more information, talk to a WSD laundry expert today.